For two nights now there have been rains, lightning, and thunder, after midnight - almost like being back in the Midwest. 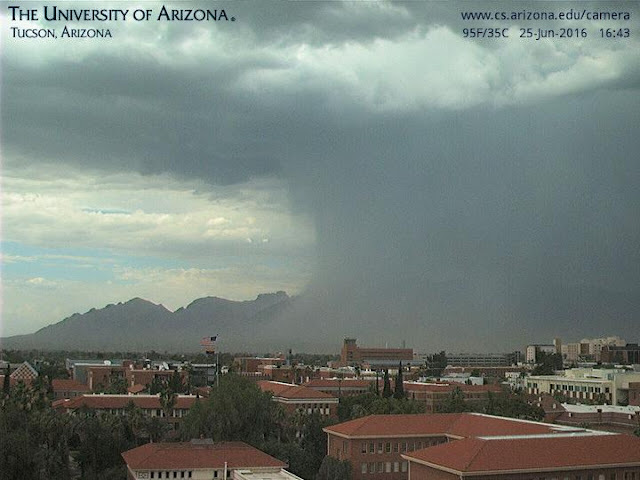 Yesterday there were isolated severe thunderstorms during the afternoon (4 reports at SPC 2 near the airport and 2 in Pinal County), but the serious rains set in again just before midnight. There was a very nice, full, rainbow at sunrise yesterday (above) and this morning there is stratus along the foothills just north of the Rillito (below). The ALERT network data are fairly interactive and allow the timing of rainfalls to be explored in fair detail. I took a look at the areal coverage of precipitation across the entire network for three six-hour periods. From 11:00 am through 5:00 pm yesterday afternoon coverage was 15%; from 5:00 pm through 11:00 pm coverage was again 15%; but from 11:00 pm through 5:00 am this morning coverage was 100%. The two sectors shown here have amounts plotted from 11:00 pm MST last night through 6:00 am this morning. 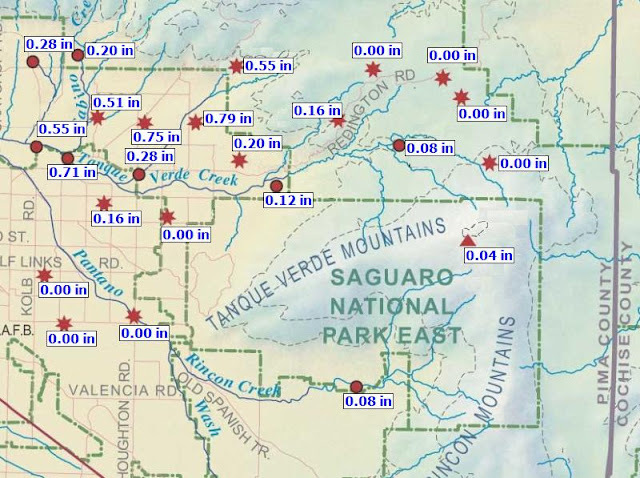 Most impressive amounts fell on the north side of the Catalinas, with nearly two and a half inches at one site. Here at the house we had 0.10" before midnight and 0.50" after midnight - what a final week for June! The plot of detected CG flashes (above for 24-h ending at 13 UTC - from Atmo and Vaisala) includes the time bar - so greens are storms yesterday afternoon, etc. Sounding below is from TWC on campus for 12 UTC - VERY moist with considerable CAPE possible with sunshine. But, of course, cloud cover is thick and very extensive. Too wet to rain? - we'll see. 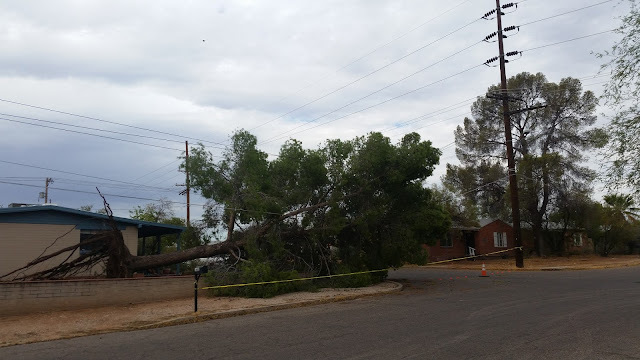 Several folks have kindly provided additional information regarding the Sunday microburst and also the Saturday downburst along and north of the Rillito. I am posting these materials here for all to see. First is a Facebook link to the Saturday downburst. This is the storm that produced gusts here that I estiamted at 60 mph. I submitted a report to NWS on this severe storm but it was apparently disregarded. Also, here's a time-lapse of the Saturday storm by photographer Bryan Snider, appears to be from A Mountain or so looking North. Note that we are very near where blowing dust stands out in the loop. Neighbor Jodi Ferner shot several brief videos as the storm intensified quickly - this one is from 7:07 pm (0207 UTC) and is just at the onset of the severe winds from the south. She shot one more at 7:08 pm and then the power went out. Presumably we lost power here as the big trees and numerous poles were going down just to our south and southwest. The only NWS report of this severe event gives a time of 7:20 pm which is basically after the most severe damage had apparently occurred. The time of 7:20 pm does, however, serve to verify their 7:13 pm severe thunderstorm warning. These are in the Samos Neighborhood, which is west of Campbell, east of Mountain, south of Grant and north of Water. Top is some roof damage and bottom is large tree tangled up in power lines. He also reported 1.44" in less than half an hour. chain saws chopped up the trees well into the night/early morning hours to clear the road. line of pine needles halfway to house. Christmas Avenue is just a bit south of here in Winterhaven. Finally, Mike Crimmins sent a rainlog map that shows the storm totals for the brief event. Many thanks to all who provided additional information regarding this severe and very unusual event! Please see previous post concerning timing of damaging winds during Sunday's microburst. So much going on that it's hard to keep up. There were widespread rains and thunderstorms during the night and early morning hours - considerably greater than official forecast, and perhaps wider coverage than forecast by the WRF model runs yesterday - which did pick up the early activity nicely. The forecast that was still up at the NWS website at 5:40 am MST this morning is shown above for TUS, indicating 20% POPs overnight. 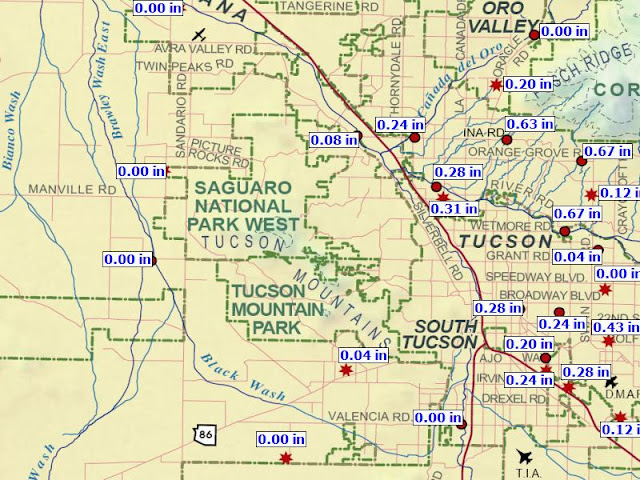 Actually, overnight 85% of the ALERT sites measured 0.04" or more rainfall. 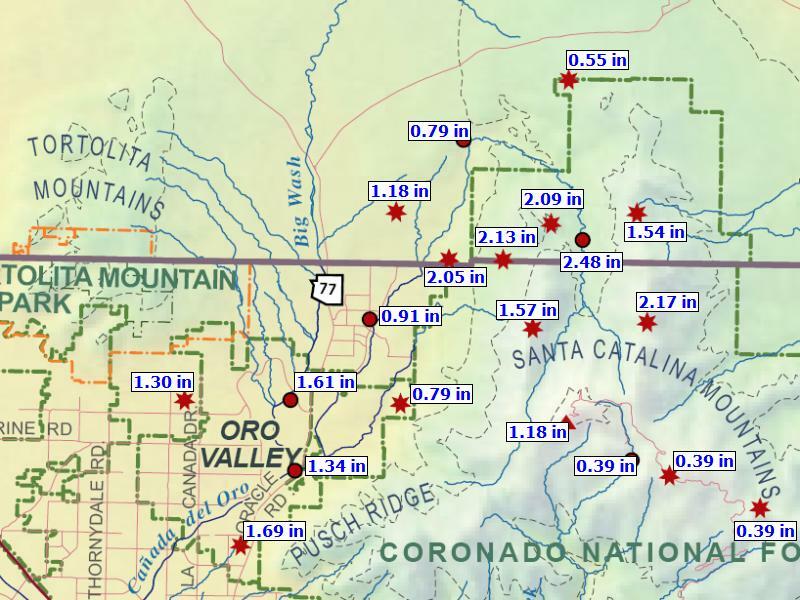 There were a number of sites over an inch and a site in the Catalinas had nearly two inches. Here at the house we had 0.01" during an early afternoon shower yesterday and then an additional 0.29" after midnight. A forecast like this, with high POPs for six consecutive 12-hour periods is unlikely to verify well, because of the strong mesoscale impacts that storms in one period have on the next period. The composite radar image below is from 5:27 am this morning. The two plots below that are for CG flash density ending at 6:45 am - the first is for past 6-hours and the bottom panel is for past 12-hours (from weather.graphics and Vaisala). Today is a very serious forecast challenge because of the nighttime storms. The morning upper-air sounding plot for TWC on campus is shown above. There has been substantial cooling below 700 mb. The sounding also exhibits an "onion" shaped profile above 850 mb, due to the mesoscale downdrafts that followed the early morning rain. This type sounding is often associated with the infamous Tucson donut hole during the afternoon. 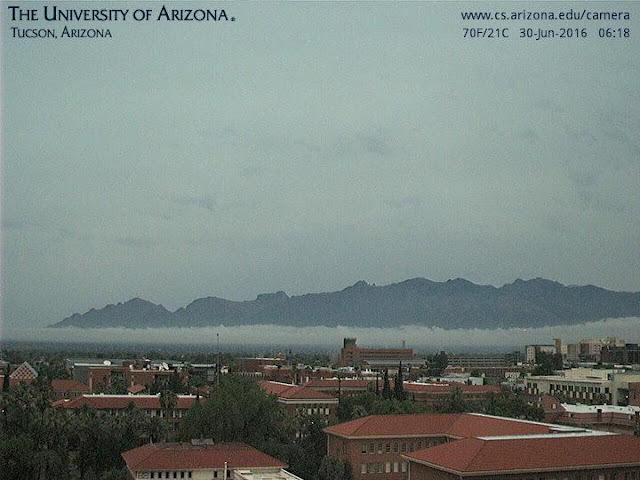 The visible image below is from 6:45 am MST and shows the extensive cloudiness from southern Arizona all the way south to Sinaloa - there also appear to be a couple of embedded cyclonic circulations. I would note that the cloudiness seems to moving toward the west to southwest, and clearing may come in from the east later this morning. The 06 UTC forecast from the WRF-NAM at Atmo seems to have problems with its forecast of the early rains being too conservative. 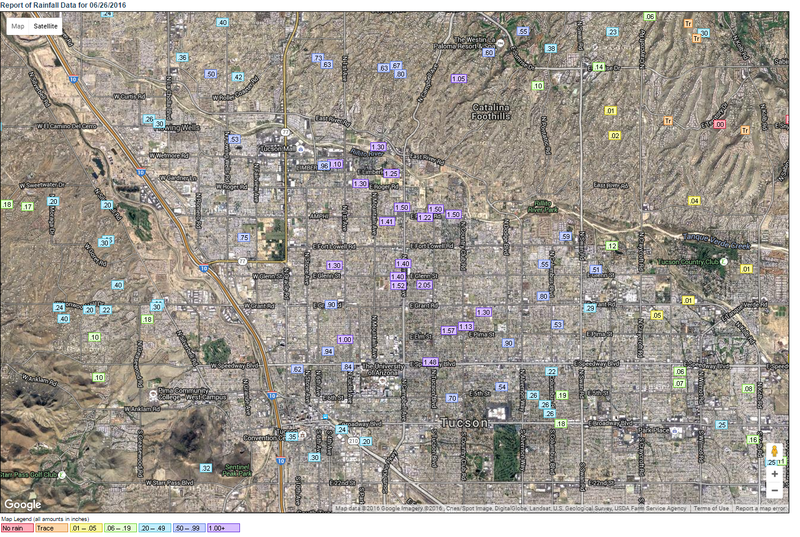 The forecast temperatures for 5:00 am appeared to be 10 to 15 F too warm over southeast Arizona. Thus, the afternoon heating and forecast of widespread storms may be too extreme. Very important to check Mike's discussion later today. Yesterday was a mostly down day, only 9 ALERT stations had very light rainfall, with these mostly at higher elevations. However, the models forecast a significant upturn in activity through the next couple of days as a distinct inverted trough moves westward across southern Arizona. This morning's sounding (above) continues to have some CAPE at low elevations, although steering level winds continue to be chopped-up. The PW is nearly an inch and a half, which is quite good for late June. The 8:00 MST analysis of blended PW from CIRA at Colorado State (below) indicates values reaching toward two inches along the Borderlands - again this is quite impressive wrt the calendar. I've just peeked at the 12 UTC WRF-NAM forecasts. 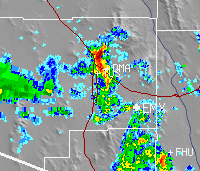 The model forecasts some afternoon storms over the eastern half of Pima county, but it is interesting that the model forecasts additional thunderstorms during the early morning hours - forecast of composite radar echoes above is valid at 1:00 am. The model really increases activity during the afternoon tomorrow, as the inverted trough moves by. The radar forecast below is quite something for 4:00 pm MST. However, the way things evolve during the early morning hours has the potential to impact the details of the afternoon forecast. NOTE - If anyone has photos of the thunderstorm please share - thanks. 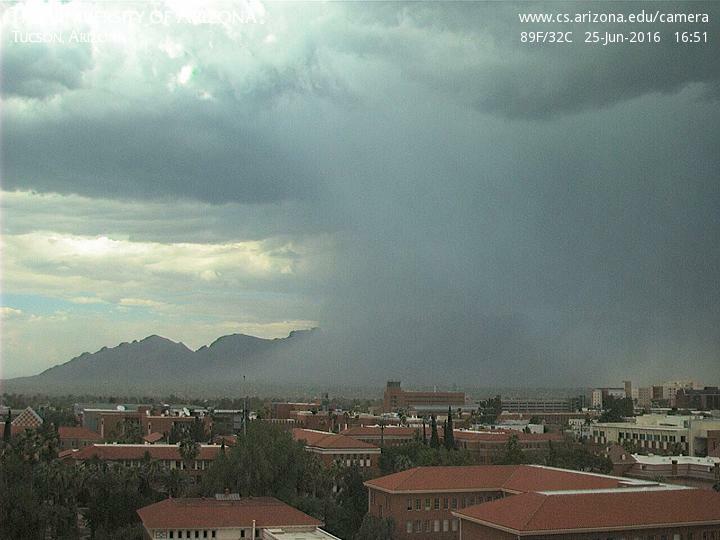 A very severe wet microburst (or a downburst with embedded microbursts) hit the north part of the City late Sunday afternoon (June 26th). The wind damage in this part of town is worst I've seen in my 20 years here. Power went off here sometime before 7:00 pm MST and came back a bit after 9:00 pm. Power was out just west of here until midday yesterday, and Prince was closed most of day as power crews worked to restore power and replace shattered power poles. 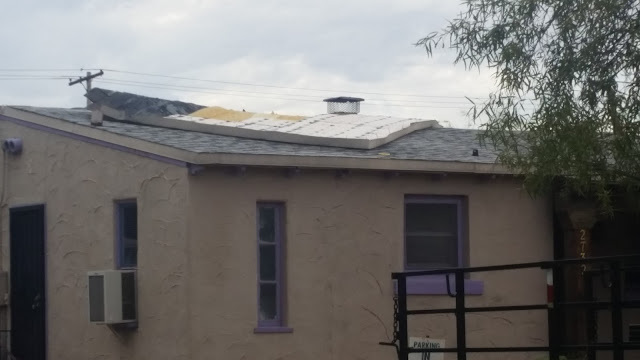 I estimate winds reached 70 to 80 mph. 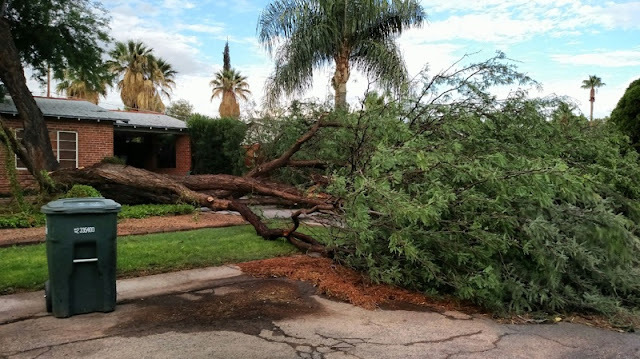 Here at house we lost about a third of our largest and most beautiful desert willow - but we were lucky compared to many folks nearby. The heavy rainfall with event was impressive and our gauge caught 1.45 inches - but I suspect that was an under-catch due to the high winds. Below are damage photos taken within about 2 to 3 blocks of the house. Every type of tree that grows in the neighborhood seems to have suffered damage (mesquite, gum, pine, palo verde, and even salt cedar), except palm trees apparently. 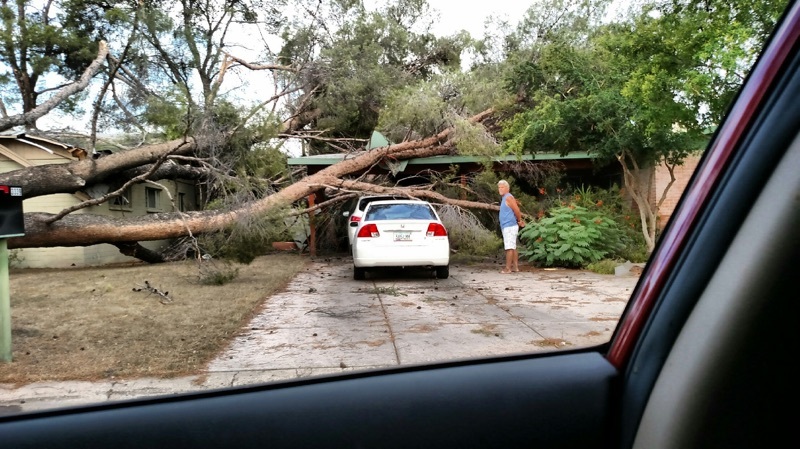 Many very old and large pines went down in the Winterhaven neighborhood - some falling on houses. One of about 4 or 5 crews out at sunrise along Prince from Country Club to Campbell. Many of the mesquite trees suffered damage about halfway up their trunks. There's a house back in there within this mess. Edited to add: Mike Luethold sent along details re NWS Warning with an issue time of 7:13 pm (first below). Power was gone here so I didn't see it. Radar indicates 60-65 dBZ in base scan at 7:08 pm (second below) - after watching radar loops, I suspect that's about when the really big trees were going down in Winterhaven. The newspaper this morning reports that the significant damage occurred mostly in the area above - about a 3-5 square mile area of the north part of the City. 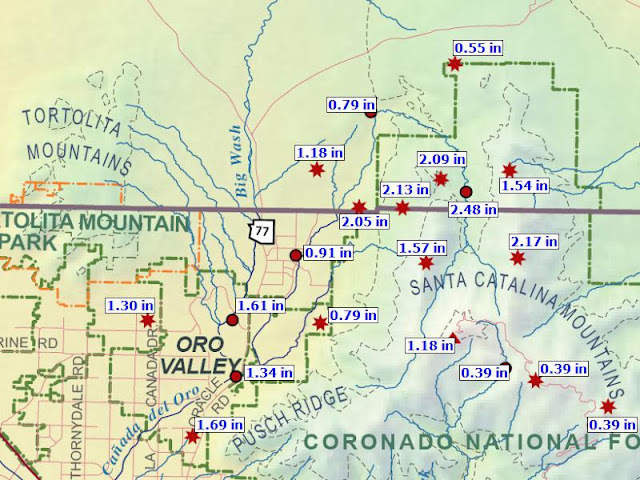 I did see damage north of the Rillito along River, which is in the County. Finally, the ALERT sector rainfall reports below are for the period from 1:00 pm to 10:00 pm MST on Sunday. No gauge captured the heavy amounts, which reached to around 2 inches. 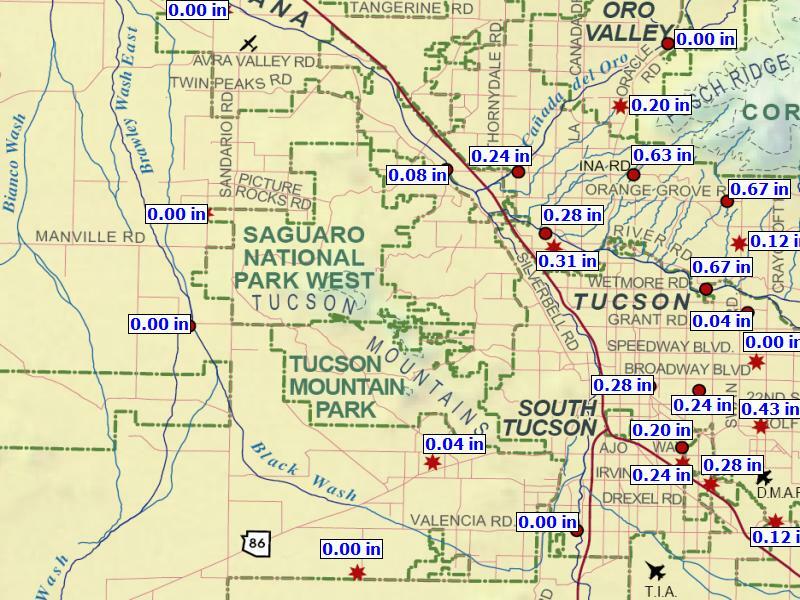 The Dodge at Rillito gauge is less than a mile east of here and the amount there (0.67") is less than half of what I measured. More later on this event. 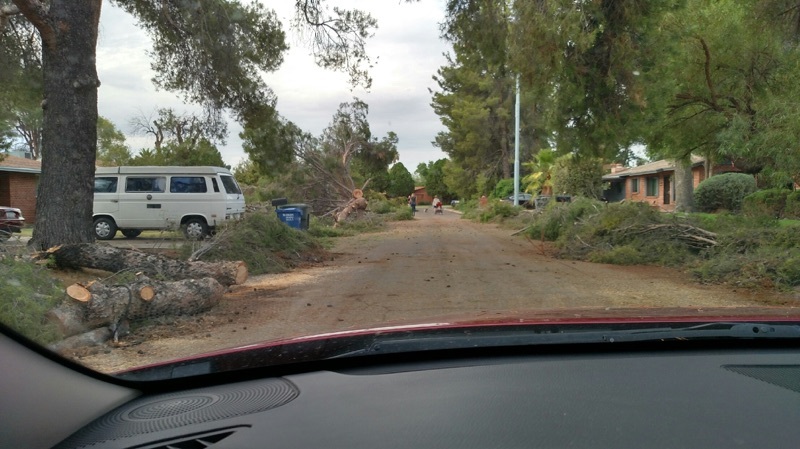 We got hit with a vengeance by Sunday's storm: heavy rain, tree limbs down, etc. Our internet has been out since Sunday night. We hope to be back online by Tuesday afternoon for a post-mortem with photos. My son from Colorado was visiting this weekend and I didn't get a chance to post much today. The 6:45 pm MST composite radar image above indicates heavy thunderstorms moving into the metro area. Here at the house we've had a cool outflow and it appears rain is imminent - for that's worth. Heavy thunderstorms developed yesterday afternoon along the foothills of the Catalinas - as per 4:17 pm MST composite radar chart above. These thunderstorms produced significant CG flash activity as per the detected flashes for yesterday afternoon though midnight last night (below, from Atmo and Vaisala). Thunderstorm activity was more widespread than the the WRF forecasts indicated. This series of three shots from the campus web camshow the edge of the storms just off to east of the view at 3:56 pm. The storms drfited toward the souothwest and the views at 4:43 and 4:51 pm show a downburst between the camera and the Catlinas. This downbrust (or embedded microburst) produced outflow winds here at the house I estimated at 60 mph about the time of the image above. We also had blowing dust and some dust can be seen at right edge of image below. There were some nasty CG flashes and crashes of thunder here with the storm but just spits and sprinkles of rain - Trace again. I submitted a severe storm report via the NWS webpage but it was not sent on to SPC. Across the ALERT network 23 of 92 sites had rainfall, with heaviest amounts occurring over the northeast part of the metro area. Above graphic shows rainfall for last 24-hours through 8:00 am this morning for the metro-east sector of the network. Several stations had right around three quarters of an inch. Mike Leuthold sent the photo below of a wash running at his place and he reported heavy rain (0.72"), nasty lightning, but no wind. Yesterday there was considerable thunderstorm activity primarily to our east and south as per the 24-h CG flash density for the period ending at 1330 UTC this morning. 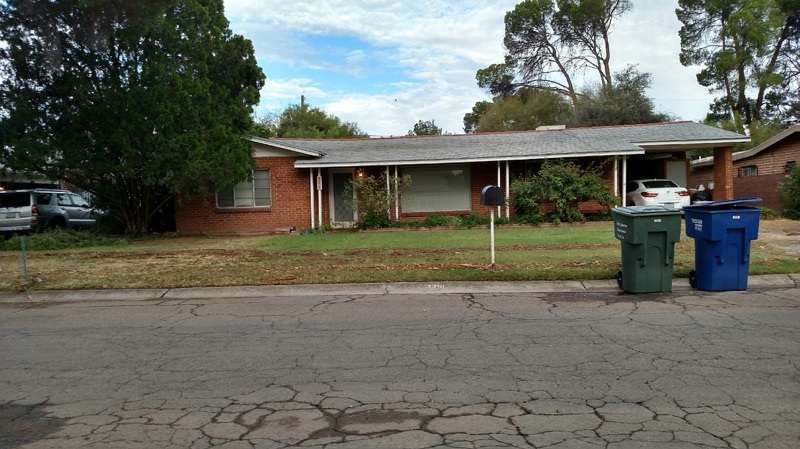 Most activity occurred over and near the Santa Rita Mountains and south to the Border. 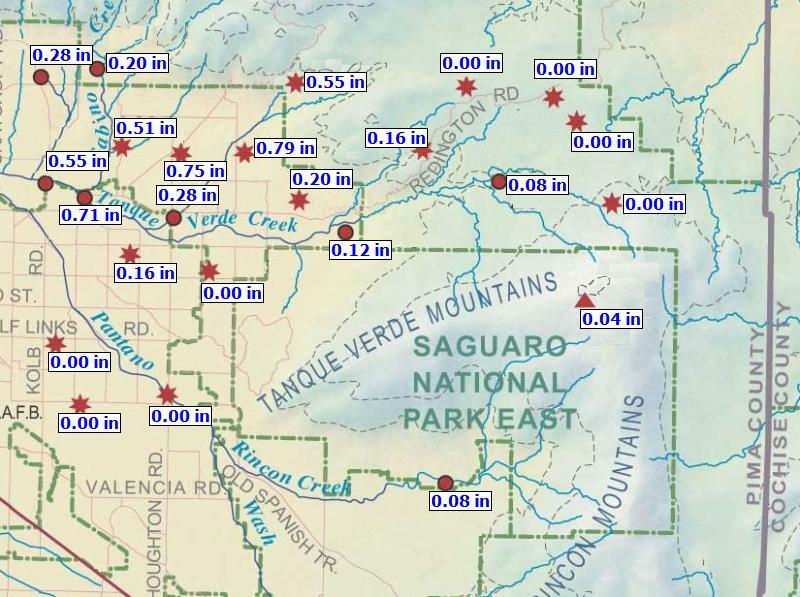 Over the ALERT network 15 sites had rainfall, with the most being 0.43" at Agua Caliente Park over toward Redington Pass. Some outflow winds occurred across parts of the metro area. 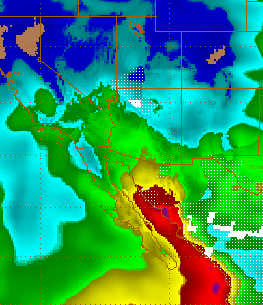 This morning there is a distinct moisture gradient present over southern Arizona, easily seen in the upper-levels in the water vapor image above from 7:00 am MST and below in the CIRA blended PW analysis (greens are higher than an inch). The basic situation has become complicated by an inverted trough at 500 mb that is located along the Arizona/New Mexico border this morning. This feature is forecast to move westward today across southeastern Arizona. The morning TWC sounding plot (from SPC above) is very similar to yesterday - there may actually be a bit more CAPE today - and winds at steering levels remain a bit chopped up. However, anvils would move off toward the east, which is a positive change in the wind profile. The inverted trough is the wild card for today's forecast. The 06 UTC WRF forecasts move it across the Tucson metro area by early afternoon, which shifts the focus of the thunderstorm activity out to our west and southwest - considerably different than yesterday's scenario. Both versions do this and below is WRF-NAM forecast of composite radar echoes at 3:00 pm MST this afternoon. Key to today's forecast will be the role and movement of the inverted trough - the new NAM forecast this morning is slower, and that movement would probably produce more activity at lower elevations of eastern Pima County. Important to check the new WRF forecasts from 12 UTC, since situation appears quite different today than it was yesterday. 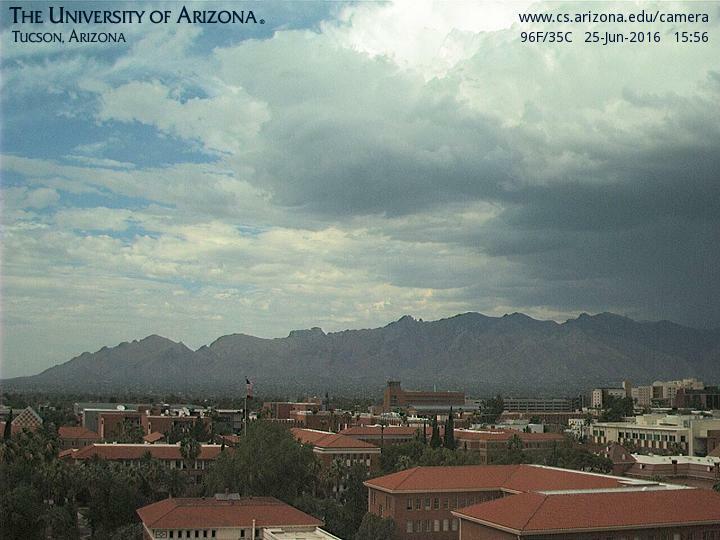 Storms have potential for wind and dust and perhaps some local heavy rains. Another batch of cloudiness moving by this morning from Mexico (visible image above is from 6:30 am MST). However, it is not nearly as extensive today as it was yesterday. A couple of ALERT sites to the south actually had 0.04" from the light showers that were around much of day. High at airport yesterday was down 11 F from that on Wednesday. Most places around the metro had at least a Trace of rain. This morning's sounding plot for TWC (below from SPC) indicates PW up to 1.41 inches (~36 mm), which is a nice increase and it's definitely humid out this morning. The sounding actually has some CAPE for low elevations, but the SPC algorithm is an over-estimate and my guess is that afternoon CAPE might be in 300 to 500 J/kg range. There is mixed flow at steering levels and winds at anvil level are unfavorable, since they would bring anvils out ahead of storms that develop to the south of metro area. 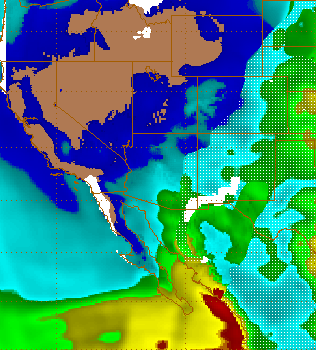 So, things are improving but clearly have a ways to for conditions to be really favorable for desert storms. The 06 UTC WRF forecasts from Atmo are a bit different with the GFS version above) having more thunderstorm activity off to our south and east at 4:00 pm. The NAM version (below, also at 4:00 pm) forecasts a couple of storms in eastern Pima County but not as much activity to south and east. So, another day to watch how the real world actually evolves.